John joined the firm in 1984 and is the managing member. He represents clients in general and commercial litigation and transactions and advises clients with respect to litigation strategy in construction, industry and business matters. John has particular experience in cases involving architectural and design issues, construction defects, and large-scale property damage. 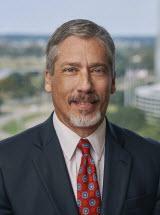 He also has extensive experience representing international, national and local landowners, timber companies, developers, investors and lenders in small and multi-million dollar acquisitions, sales, leases and financings (involving timberlands, industrial plant sites, retail subdivision developments, residential developments, hotels and restaurants). Counsel to the Creative Casinos, LLC and its successor in interest, Ameristar Casinos, Inc., in reference to the negotiation and acquisition of a 243 acre leasehold for a new $500 million casino, golf course and 700 room hotel resort complex, addressing title, zoning, development and construction issues, as well as the negotiation of development and tax-sharing agreements with local authorities, and agreements with a neighboring competitor and other landowners. Counsel to national, regional and local commercial developers of hotels, retail centers, retail stores, restaurants, theaters, apartment complexes, residential and office park subdivisions.